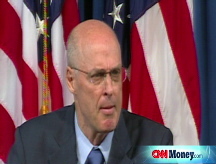 Treasury chief Paulson unveils historic government takeover of twin mortgage buyers. Top executives are out. Do you think the government takeover of mortgage buyers Fannie Mae and Freddie Mac was a good move? NEW YORK (CNNMoney.com) -- Federal officials on Sunday unveiled an extraordinary takeover of Fannie Mae and Freddie Mac, putting the government in charge of the twin mortgage giants and the $5 trillion in home loans they back. Fannie (FNM, Fortune 500) and Freddie (FRE, Fortune 500), which were created by the U.S. government, have been badly hurt in the last year by the sharp decline in home prices as well as rising mortgage delinquencies and foreclosures. All told, the two firms have racked up about $12 billion in losses since last summer. On Sunday, officials stressed that both Fannie and Freddie will be open for business on Monday morning, although the firms will have undergone a dramatic facelift by then. Freddie CEO Richard Syron and Fannie CEO Daniel Mudd will no longer run the agencies, while the FHFA will assume control of the boards. Regulators took care not to foist blame on the two executives, adding that they would stick around to help with the transition. David Moffett, who served as vice chairman and chief financial officer of U.S. Bancorp until early 2007 and then joined the Carlyle Group private-equity firm as a senior adviser, will take over Freddie Mac. The government, in agreeing to backstop the firms, said it would receive $1 billion in each company's senior preferred stock. The government will also receive a quarterly dividend payment and the right to own 79.9% of each company. Sunday's announcement brings an end to months of speculation about the fate of the two firms. Shares of Fannie and Freddie, which have fallen more than 80% as of the end of Friday's session, were hammered this summer among concerns they would need to raise additional funds to cover future losses or need to be taken over by its federal regulator. Investors feared that either step would reduce or wipe out the value of current shareholders' stakes. Officials ruled out a capital infusion - a less drastic option than convervatorship - after considering questions such as whether the government would have to keep putting money in and how best Treasury officials could protect taxpayers, according to one of the sources. In the end, the route taken amounts to "a timeout, not a liquidation," says the source. "Conservatorship leaves all options open for the next administration." The Treasury-FHFA plan, which was widely anticipated after financial markets closed on Friday, drew praise from regulators, lawmakers and some market experts. At first blush, Wall Street seemed encouraged by the news, although the true test will come when financial markets around the globe open Monday. Pimco's Bill Gross, a widely followed bond fund manager, said that the Freddie-Fannie plan was the right move. 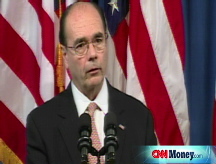 "This is a significant step and almost exactly what we had hoped for," Gross told CNNMoney.com Sunday. In addition to confirming the government's sovereign credit rating, Standard & Poor's affirmed its sterling AAA rating on both Fannie Freddie on the news, adding that its outlook for the two firms is stable. The cost of the government intervention remains unclear however. Experts argue that it will depend in large part on the structure of the rescue, the direction of home prices and mortgage default rates. Some of the nation's largest financial institutions including JPMorgan Chase (JPM, Fortune 500) and Sovereign Bancorp (SOV, Fortune 500) own a big chunk of the estimated $36 billion in preferred shares of Fannie and Freddie, according to research published last month by Keefe, Bruyette & Woods, an investment bank that specializes in financial firms. Those stakes are at risk of being wiped out as a result of Sunday's announcement. Top banking regulators, including the Federal Reserve as well as the Federal Deposit Insurance Corp., said in a joint statement Sunday that a limited number of smaller institutions have significant preferred share holdings in Fannie and Freddie. They added they are prepared to work with these institutions to come up with a plan should they need to raise capital. Still, the rescue of Fannie and Freddie could go a long way toward its intended aim - bringing stability to the housing market while making it easier for consumers to obtain affordable mortgages. An earlier version of this article incorrectly stated that the government would invest $1 billion in each company's preferred stock. --CNNMoney.com senior writer Tami Luhby and Fortune editor at large Patricia Sellers contributed to this report.